When making the jump from simply planting food plots to full-scale habitat management, one of the best places to start may be right on the edge of the plots! Edge feathering is a technique used to increase the food and cover of the edges of fields, and is a relatively easy project that can be completed around most food plots in a few hours. While I would certainly encourage anyone to manage their entire forest, field edges offer a unique opportunity because of the increased sunlight coming in from the opening. This eliminates much of the cutting required to increase forage in the woods. 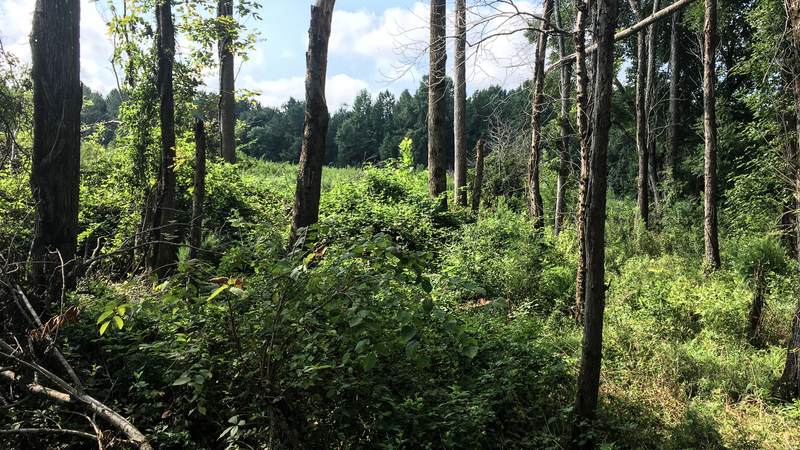 Additionally, cutting trees along the edge of a food plot will help the plot grow better, as standing timber can shade the plot and take up valuable nutrients along the edge. Aside from helping the plot grow and increasing the amount of deer forage available, edge feathering can also add more attraction to the food plot by providing better cover around the field. The goal of edge feathering is to create a mixture of herbaceous and shrubby vegetation between the field edge and the forest. Typically, it occurs along a gradient, with the edge closest to the field being more herbaceous (i.e. “weedy”) and the edge closer to the timber having more live trees. 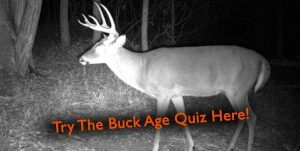 The gradient of vegetation can vary on a number of factors, but it usually results in a general increase in vegetation height as one moves away from the food plot. In other words, the field edge transitions from herbaceous vegetation to brambles to shrubs to standing timber. The result is a “soft” edge where the vegetation slowly changes from field to forest, as opposed to a “hard” edge where the transition is much more abrupt. This structure is produced by cutting and/or killing trees along the edge of the field. Edge feathering is a relatively simple technique, and requires no complicated tools. I typically will treat a 30 to 50 yard strip around the field, but more or less can be treated depending on how much time you have. To complete the treatment, I take a chainsaw or hatchet and a bottle of herbicide. I prefer to use a chainsaw, but the hack-and-squirt technique can also be used. 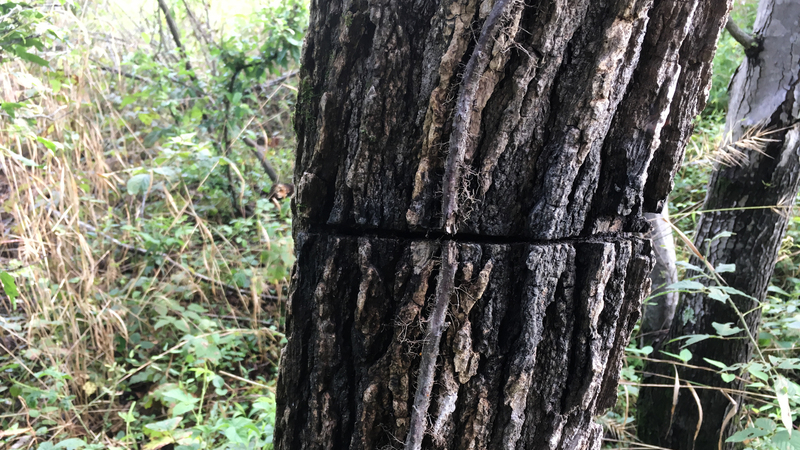 Right along the field edge, almost all trees should be cut except for the occasional oak, persimmon, or treestand location. This maximizes the amount of sunlight on the ground adjacent to the field, which promotes a response from desired vegetation. (Above) This tree was girdled with a chainsaw and herbicide was sprayed into the cut. This only took about 10 seconds and the tree was completely dead in a few months. As you move away from the field, a few more trees can be left standing. I generally kill most of the trees within the edge feathering, but having more live trees farther away from the field is the goal. Regardless of the location of the tree, most of my selection is based on tree species composition. I will leave most oaks and persimmons alive to produce mast for deer, even if they are close to the edge. On the other hand, nearly all elm, sweetgum, red maple, and yellow poplar are cut throughout the feathered edge. Some trees that produce sprouts that are readily eaten by deer, such as red maple and yellow poplar, may be cut down but not treated with herbicide. However, most of the trees within the treatment should be killed with herbicide to increase the coverage of herbaceous vegetation. While it is not always necessary, it is often beneficial to include approximately 10 yards of the field perimeter in the feathered edge. Doing so allows more herbaceous vegetation to grow adjacent to the food plot, and also accounts for trees that will inevitably fall into the plot during the cutting. If non-native perennial grasses are present along the field edge, it is critical that they are first killed before establishing a feathered edge, otherwise they will prevent native forbs from establishing. (Above) Check out all the food and cover growing along this field edge! Blackberry, pokeweed and greenbriar are all growing in this feathered edge providing a sense of security to deer entering the plot. Time to fire up a saw! Given the benefits to deer and relatively low time commitment, I would encourage anyone interested in habitat management to consider adding feathered edges to their food plots. Confidence in timber management is only gained through experience, and edge feathering yields a great opportunity to dip your toes into the water. I hope you have time to fire up a saw this week and help create more deer forage and cover on your land! Mark is a co-founder of Hunt The Land and a graduate of the NC State University Fisheries, Wildlife, and Conservation Biology program. He is currently studying the effects of hardwood forest management on white-tailed deer and wild turkey habitat as a graduate student at Auburn University.